Boats competing in the Volvo Ocean Race were transported onboard an armed ship again to the safe haven of the Maldives capital because of the threat of pirates along the east coast of Africa. Dutch ship Happy Diamond was protected by barbed wire when it delivered the six-strong fleet safely to Male. "It has been a very tense and difficult time for us, and obviously we did not want to have to take this measure," Race CEO Knut Frostad said. "But we had no option but to take our security experts’ advice. Now we’re just looking forward to getting back to racing." In an unprecedented move the 38-year history of the race, boats in the race were transported in late December on an armed ship through the Indian Ocean. They completed the leg with a short sprint into Abu Dhabi in the first week of January. More than four months ago, only team and race officials knew of the decision to use the Maldives as a safe haven. They were required to sign non-disclosure documents. The race, which started in late October from Alicante, Spain, has already had its share of drama. The boats were forced to suspend racing four times because of broken rigging and a holed hull. The third leg promises to be just as hazardous with the fleet racing more than 3,000 nautical miles across the Indian Ocean, through the Malacca Strait and into the South China Sea. The fleet will face monsoon winds and long stretches of upwind sailing through rough seas. They’ll dodge container ships while picking their way through some of the busiest shipping lanes. 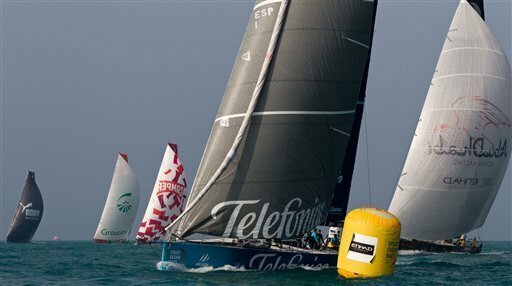 Team Telefonica of Spain, led by co-world sailors of the year Iker Martinez and Xabi Fernandez, lead the overall standings. Camper (Spain/New Zealand) and French boat Groupama trail the leader.